New make-up collection of Giorgio Armani Beauty has six new Eyes To Kill Eyeshadows, five of which I would like to introduce to you today. Kaleidoscope Collection also features six lipstick (swatched here) and two Face&Eyes Palettes (reviewed here). Face & Eye Palettes as well as new ETK Eye Shadows all have "Scarabeo Edition" denoted on their packages. Scarabeo (scarab in English) as far as I am concerned is the holy beetle of Egypt, which also explains the beetle names of ETK eye shadows. According to Wikipedia Scarab Beetles are a family consisting of 30 000 species, providing enough inspiration for Linda Cantello, the international make-up artist of GA who designed this collection. All the colors have iridescent duo-chromic almost holographic quality which makes photography and shade definition a challenge but I am willing to try my best for these beauties. I took photos under sun and in shadow to give you a better idea. #30 Rose Popillia: A light pink duo chrome appearing mauve at some angles. On my lids it also leaned warm and gold. This one looks exactly like the right wing of this Japanese Popilla Beetle. #31 June Beetle: It is a gorgeous baby blue leaning turquoise depending on light. This one is less complex than Rose Popillia and appears much bluer than a green june beetle, nevertheless a gorgeous color. #32 Gold Hercule: Although the name suggests gold, it is more of a golden green, very much like the wings of hercule beetle. Again it has duo chrome property and appears more gray or more gold depending on the light and angle. It reminded me slightly of Chanel's Peridot nail polish. #33 Scarab Violetta: This one is a light iridescent lavender. It has a gorgeous shine under the sun but in shadow it appears as a cool lilac. 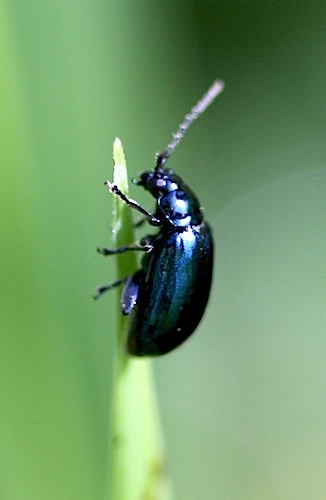 The inspration might have been taken from a beetle, such as this one. #34 Blue Beetle: This is one of the stronger duo-chrome shades, changing between turquoise and violet, even in shadow. 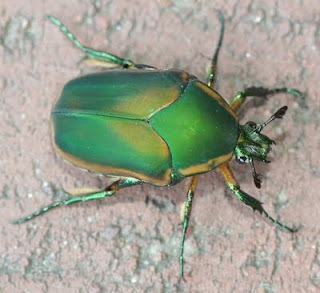 Again very iridescent, lovely, no words to describe, maybe this beetle can tell it better. I compared #30 to the closest shades in Armani ETK range. This one might be close to #8 too, which I (not yet) own but I suspect #8 would be much more pink than #30 which is more natural, almost like skin color shade. As you see below, #9 is more peachy and more of a frost compared to #30. The shades in Scarebeo range are iridescent but they are not frosts which can be seen clearly in the following swatches. #28 leans also more peach and is darker. #27 is more violette and darker. I then pulled out the purple leaning shades from Armani ETK range, #3 and #4 to compare with #33. #33 is cooler and lighter once compared to #3 and #4. ETK #3 is purple with golden sparkle, it is darker and warmer. #4 is more of a gray purple, whereas #33 can be described as a true lavender. Check the below swatches to see how #33 appears green towards the bottom because of the curve of my arm and light hiting at another angel. Isn't it exciting? Next comes the comparison of two bluish shades from Scarabeo Edition, #31 and #34. Do you remember the Bronze Collection for 2012 Summer? There were 4 blue/green/gray shades in that collection, so I was more hopeful that I could find dupes. #1 is darker and more blue, without too much gray or green. # 10 and #12 appear almost white and they are way more frost compared to the others. #31 and #22 are close, #22 has less green in it and also more white. #22 doesn#t have the duo chrome effect #31 has. Between #21 and #34, #21 is more gray, #34 leans more turquoise with duochrome property which gives it a purple glow at some angles. Last comparison is between the lighter golden shades of Armani ETK range and #32 from Scrabeo Edition. After the swatches I have seen that I should have added the famous #23 (Madra Perle) from Bronze Collection to the blue shades comparison above, so I threw #31 in here too to compare those two. The golds I know of ETK range which are not strongly yellow are #18 and #19, from Holiday 2011 collection. These are close shades in terms of lightness but lack the green duo chrome property of #32. #23 and #31 are also close, #31 showing more blue. Isn't that interesting that #32 shows more yellow in shadow and more green under sun? All in all no real dupes. I think #23 Madra Perle, which was one of the most popular/unusual shades of Bronze Collection is the closest shade in terms of iridescent color-changing property to the ones from Scarabeo Kaleidoscope Collection. Today I am wearing an eye look which I created using all five shades at once. I am very excited about these, the colors are so unusual. Some may find those interesting shades hard to wear. I believe that #30 is going to be the most popular one. I am going to post today's look soon. This post became way too picture heavy so I am sharing the comparisons and the swatches for the time being. As for the quality, the shades can be intensified by wet application and they wear like stone over a primer all day long. They don't fade and budge. Armani Eyes To Kill Eyeshadows are one of my most favorite eye shadow formulas of all times, if not the "top" one. Final thoughts: Very usual shades and texture. Duo-chrome, holographic, whatever you would call it. The quality is au pair with Armani ETK range, blending easily, lasting all day long. Nothing but love! How do you find these usual shades? Do you think you would find yourself wearing these often? Which shade is your favorite? LOL, we all are! I went there and picked up the last missing piece which I couldn't resist LOL. These are so gorgeous, Sara! I am going to have to run to a counter and swatch them. They are really just so stunning! They really are. I couldn't resist even for a few minutes after swatching them and took them with me. I just left the silver one behind but I am ashamed to tell you here that I craved and got that one too. LOL. Let me know how you like these after swatching. I had absolutely no idea that there was a Galerie Lafayette in Strasbourg-- lucky you having one so close to home (I suspect that if it were closer than a 1 1/2 hour drive that you would be in SERIOUS trouble!!). OMG, I will definitely let you know when I make my next trip to France. My cousin really wants me to come-- and actually just invited me to a a Swiss Chalet that she visits often. I think she's trying to torture me since she knows I am stuck in the States for a while because of work! :( I would love to join you in Paris in June 2014. Hopefully I can make it!! That would be SO much fun. I definitely am grateful to have family in Paris-- my dad basically grew up there (from young childhood to young adulthood)- so I definitely have a very deep sentimental attachment to that city. I agree, I should definitely visit more often!! We will definitely revisit this topic as it gets closer! I hope that you have a lovely week! But I am very happy that you could lay your hands on #30. That one sold out here in a few days. I was wearing it a few days ago, combined with #2 on the crease and some people commented on it saying how unique it looks. I hope you enjoy yours too. Thanks so much for your comment xox. How dare you entice me to purchase this entire collection! I'm not even supposed to be shopping and then you just HAD to post these photos. This is one of the most tempting collections I've seen in a long time. Hi EVR, I can totally feel you. This collection also caught me by surprise and vacuumed all my money away LOL, I love those ETKs, they are so pretty and unique.